I was told not to look them in the eyes. Be non-threatening. Turn off your camera’s flash. Don’t get in their way. Stay at least 5 m away at all times. Oh my God! This is real. I’m about to walk into the dense Bwindi National Forest in Uganda in search of a community of gorillas. I’m about to enter their home and hope with my life that they don’t mind. I must be out of my mind. The morning of my gorilla trekking adventure with Africa Adventure Safaris was intense. I stood like a robot listening to the instructions. I wanted to take it all in. I was scared. The whole thing seemed like an unbelievable adventure but now that it was about to happen, I was fearful. These are wild, free gorillas we’re talking about. 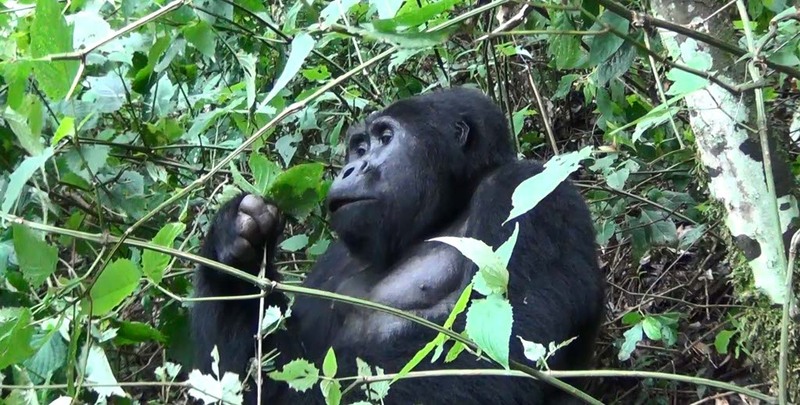 They have, however, undergone “habituation.” This refers to the process where through daily, peaceful contact with humans, gorillas have slowly lost their fear of humans and have learned to view them as neutral beings in their environment. Habituation usually takes about two years. The guidelines established for tourist visits have been developed to respect the special relationship that exists through habituation. Gorillas are naturally afraid of humans and typically will flee or aggressively charge if people get too close to them. Has the habituation process been enough? I was about to find out. We began trekking through the forest in a group of six guests, one main guide, and two armed guides. The armed guides were there to fire shots into the air if elephants or other animals posed a threat. Wait, what? So besides the gorillas, I have to worry about mountain climbing elephants and Lord only knows what else! What was I thinking? After about an hour and a half of trekking down hill through thick bush, I started to worry about the trek back. If we were going down for over an hour, did that mean that we needed to hike back the same way we came in? I was already exhausted. This was a trek for fit people. I was in the wrong group. Did I miss the mountain gorillas on the side of the road? Nope, this is the real deal. I was going to have to work for this adventure. I was following the guide closely when he stopped and said, “They’re here.” I didn’t hear anything. Unlike the chimpanzees, it was quiet. No screaming. No yelling. Peacefully quiet. Then I saw one. He was sitting up and chewing on leaves. I grabbed my camera and triple checked that the flash was off before I started to take photos. At first, we were all whispering and standing very still. I couldn’t believe my eyes. He was only a few feet away from me and he continued to eat without acknowledging me. He was huge. His massive fingers grabbed at the leaves and he shoved them into his mouth, branches and all. Two younger males played in the treetops. They chased each other and pounded on their chests. The dominant male tackled the other one until he backed off. He then walked higher in the tress and pounded on his chest. This happened about five times until the less dominant male lost his balance and fell from the trees. Besides his pride, nothing was hurt but he’d given up on the game and laid down on the ground for a rest. He played with the branches with his feet and picked off a few leaves to eat. We’d gotten over whispering and realized we could talk freely. The gorillas weren’t bothered by us. It felt safe, but not too safe to let our guard down or ignore the guide. One male was resting in the bushes and I watched him yawn. His massive teeth were a reminder of his power and wildness. When he stood up and moved toward me, I froze and quickly put my head down. He was getting closer. Didn’t anyone tell him about the 5 m rule? I backed up. He continued. I backed up more. He continued. Sh*t! He’s going to pass me. Yep, I thought about closing my eyes and maybe praying. The guide realized what was happening but he told me to stay still. This gigantic male gorilla with his fangs and wide, muscular arms walked so close to me that I could have moved my hand and touched him. Then, he climbed a tree and continued on with his day. It was nothing for him but I thought I’d need a new pair of pants. We spent an entire hour with the gorillas and I was full of adrenaline. I could have run out of the forest I was so excited. Or maybe not. Nope, definitely not. Thankfully, we didn’t take the same path out. It was only twenty minutes to the pick-up location. It was a full twenty minutes of up hill walking in steep, thick bush but I thought about the interaction I just experienced and it made it all manageable. My legs were burning when we reached the road and I didn’t think I could take another step but it was worth it. I was able to experience something so few people will ever experience in their life. I came face to face with a community of mountain gorillas and I watched them in their natural habitat for over an an hour. This is what dreams are made of. It was a glorious moment that will always remain a highlight of my life. This journey was made possible because of the support of Africa Adventure Safaris, but all opinions and thoughts are my own. 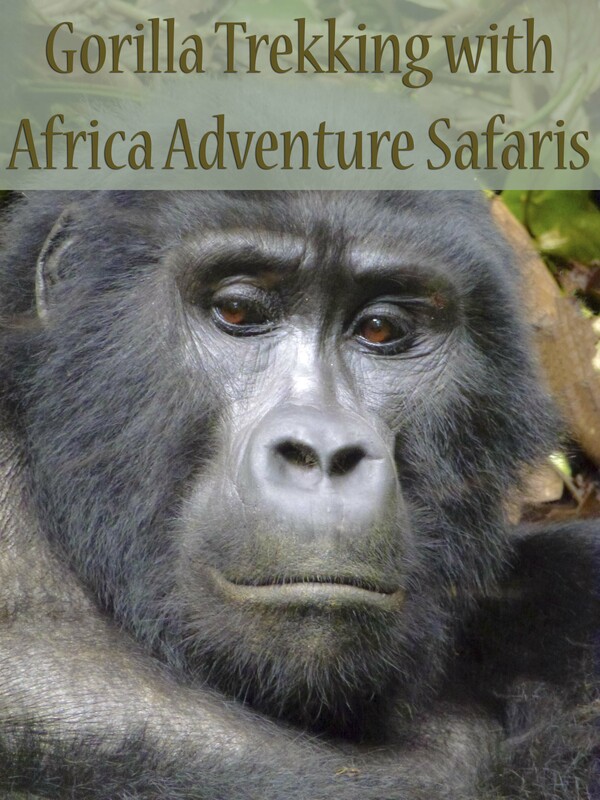 This entry was posted in Adventure, Africa, Travel, Uganda and tagged adventure, African Safari, bucket list, bucketlist, Bwindi National Forest, Gorilla Trekking, travel, Uganda, wild by lesleycarter. Bookmark the permalink. My father was there in 1996 & loved this Country & the gorillas. I love the country almost as much as I love the wildlife. Do you have any of your father’s photos? Oh Mah Gaud! Ten points for not running away. That must have been so scary and exilerating all at the same time. Yeah, it was pretty spectacular. Is it something that’s on your list? Africa certainly is but I don’t know about an up close with gorillas! Having said that though I would take advantage of the opportunity ever presented itself for sure. What an experience for you to have, being so close to those gorillas. My heart was pounding reading it, I probably would have passed out if I was there. How lovely it must be for you to have such amazing memories. Great post and you did an exceptional job of explaining the emotions and fears with such close encounters, but in reality, you really have to go and experience it. Nothing we had read, or previous safaris prepared us for being so close to wild animals. Did you do the gorilla trek as well? I would have shat in my pants too. For those of us who have aspirations of traveling, you constantly add places to our “must see destinations” Thank you Leslie for sharing your wonderful experiences with us! Thank you for reading, Daniel 🙂 Where would you like to go the most? As of right now Scotland. I want to visit the castles and the beautiful scenery the country has to offer. Very cool experience! My dad and brothers went on a gorilla trek many years ago, only they were charged at by a gorilla. The guides ran and so they ran too! A week later, a volcano erupted in the area and the guides said that was why the gorilla charged. He sensed something was wrong. Thankfully, all went well. Wow! I heard so many people being charged but I didn’t experience anything like that. Maybe it gets less aggressive with time. Did they go in Uganda too? What an amazing experience! I don’t think you’re alone in thinking you’d need a new pair of pants! I live in Nigeria in Africa and I have never been to any other African country! Your writing is brilliant and stirred up excitement in me that pushes me to go on this adventure! This has been on my Bucket List for most of my life… thanks for sharing your adventure! I’m assuming you’ve seen Gorillas in the Mist? If not, you MUST. That’s where it all began. Diane Fosse was amazing. Yes on Gorillas in the Mist and I felt like I was in the movie. Unbelievable! I can’t wait to read about your experiences when you go. It’s one of the greatest travel experiences of my life. Thanks Lesley for visiting Uganda – the Pearl of Africa. Your article about the Gorillas is superb! 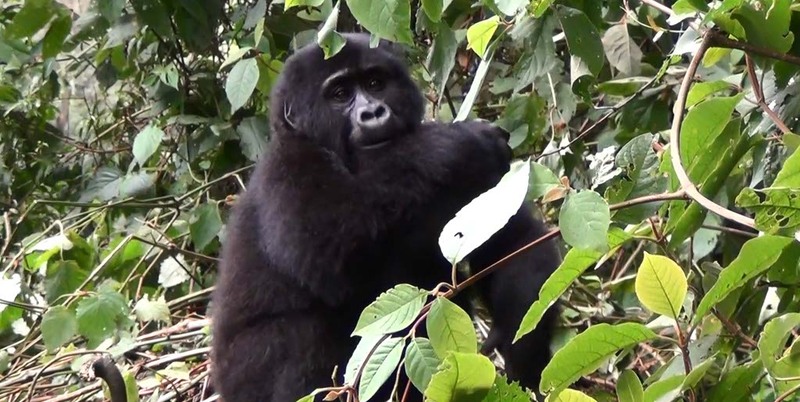 Mountain Gorillas are a must do for any traveler that plans on coming to Africa, the experience is very safe and also a contribution towards conserving these great apes. Thanks Lesley! LOL — I think I would need a new pair of pants, too. What an amazing experience being so close to them. Loved the photos, too! What a lovely write up! Gorillas are amazing. Hope this encourages everyone to go and see them and support the industry that protects them. I saw two babies playing once, utterly adorable. WOW! That must have been a very amazing experience. I love hiking and nature and right now I wish I could get to do this someday 🙂 Thanks for sharing since I felt I was right there with you. What an amazing adventure. Gorillas are fascinating. Your pictures are fantastic! We cant’s wait. We go on our first Gorilla trek in a few months. Over all 52 weeks in Africa! Can’t wait. Wow! 52 weeks in Africa! That’s amazing. What other countries are you visiting? Are you traveling with family/friends? I’d love to know more. Amazing! What an incredible experience!